The outdoor map Sevettijärvi-Nuorgam covers the eastern Utsjoki wilderness area and its surroundings. Map of the Tana River to the north, the Norwegian border in the east and west. In the south, is shown Sevettijärvi surroundings. The map scale is 1:100 000 (1cm on the map = 1 km off-road). 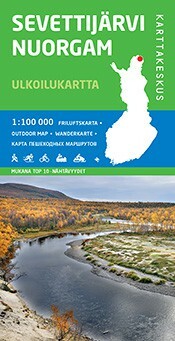 On one side of the printed outdoor map covers Kaldoaivi Wilderness Area, Sevettijärvi-Nuorgam-Trail, Näätämöjoki fishing grounds as well as the environment Sevettijärvi hiking terrain. Map is especially suitable for hiking on foot or on skis. In addition, there are Sevettijärvi and the region's water Näätämö hiking trails and the region's snowmobile trails.